Your ultimate source for Kingdom Hearts media, Kingdom Hearts news. Kingdom Hearts discussion, cutscenes, cheats, and more! As of now, there is no word on when this particular story update will be available internationally. During the 2019 Game Developers Conference in California, Gamereactor got a chance to speak with 'Kingdom Hearts III' co-director, Tai Yasue, where he gives more details about the upcoming Critical Mode update for the game, as well as talking fan expectations and the process of integrating Disney properties into the game. Check out the full video interview here. Welcome back to Daybreak Town! Everyone ready to see how your hard work has stacked up? In fifth place this week is KHV_Unicornis with a total of 2,944,983 Lux! The top scorer was @LadyAzura with 2,944,983 Lux—exactly 100% of the party's earnings. In fourth place this week is KHV_Vulpes with a total of 165,553,177 Lux! The top scorer was @Fearless with 144,688,188 Lux—about 87% of the party's earnings. @Aidan followed with 11,734,954 Lux, and @Katterpie with 5,669,038 Lux. In third place this week is KHV_Ursus with a total of 174,559,437 Lux! The top scorer was @tamale with 174,559,437 Lux—exactly 100% of the party's earnings. In second place this week is KHV_Leopardus with a total of 327,078,984 Lux! The top scorer was @Cat~ with 264,827,581 Lux—about 81% of the party's earnings. @Haseo followed with 43,957,966 Lux, and @Noizless with 18,293,437 Lux. In first place this week is KHV_Anguis with a total of 2,282,988,332 Lux! The top scorer was @~Acy_XIII~ with 2,266,733,260 Lux—about 99% of the party's earnings. @Explode followed with 16,183,644 Lux, and @Day~Dream with 70,802 Lux. Congratulations to the Keyblade wielders of KHV_Anguis! Master Invi would be thrilled with all your work! Maintain your top position for one more week to earn the Party Don't Stop pin! Special congratulations to this week's top scorers from each party—LadyAzura, Fearless, tamale, Cat~, and ~Acy_XIII~! You'll all be sent special pins to commemorate your accomplishments if you've not yet received one! If you want to join in the competition, you can still sign up for our official KHV parties here! NOTE: If your Player ID is not already recorded in the party sign-up thread, please post it there in order to facilitate the creation of these leaderboards every week! See you all back here at the fountain plaza next week! Nico nico niiiiii~!!! Okaeri to Daybreak Town! Let's see how you idols scored in this week's competition!! In fifth place this week is KHV_Unicornis with a total of...zero Lux? Eeeeeh?! Better luck next time! In fourth place this week is KHV_Ursus with a total of 70,058,046 Lux! The top idol was @tamale-kun with 70,058,046 Lux—exactly 100% of the party's earnings. In third place this week is KHV_Vulpes with a total of 91,856,346 Lux! The top idol was @Fearless-chan with 84,119,040 Lux—about 92% of the party's earnings. @Katterpie-chan followed with 5,438,431 Lux, and @Aidan-kun with 2,272,744 Lux. In second place this week is KHV_Leopardus with a total of 2,265,298,572 Lux! The top idol was @Cat~-chan with 2,137,306,792 Lux—about 94% of the party's earnings. @Noizless-chan followed with 113,988,494 Lux, and @Haseo-kun with 9,461,942 Lux. In first place this week is KHV_Anguis with a total of 4,767,916,551 Lux! Shiny!!! The top idol was @~Acy_XIII~-chan with 4,761,818,920 Lux—about 99% of the party's earnings. @Explode-kun followed with 5,161,984 Lux, and @Odamadillo-kun with 494,744 Lux. Congratulations to the idols of KHV_Anguis! Invi-sama would be thrilled with all your work! Maintain your top position for two more weeks to earn the Party Don't Stop pin! Special congratulations to this week's top idols from each party—tamale-kun, Fearless-chan, Cat~-chan, and ~Acy_XIII~-chan! You'll all be sent special pins to celebrate your accomplishments if you've not yet received one! See μ all next week! Do your Rubesty!!! 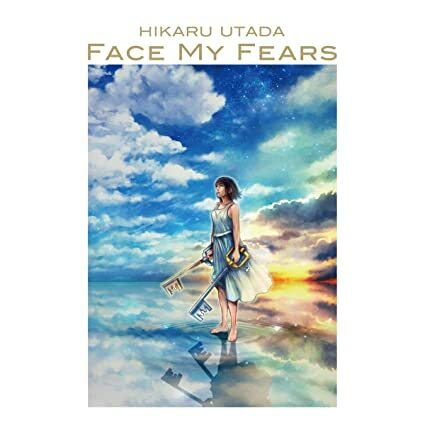 The 'Face My Fears' EP, containing both the English and Japanese versions of 'Face My Fears' and 'Don't Think Twice', has been released on vinyl today, allowing vinyl collectors to add a piece of Kingdom Hearts music to their collection! The vinyl can be ordered from Amazon here.